Caring for a new lawn once it is laid is crucial. Just a few minutes every day will help it establish well and ensure your investment thrives! 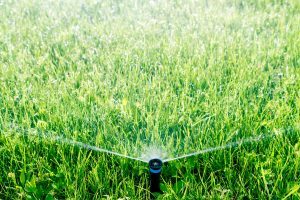 As soon as the lawn is laid start watering, the aim is to keep it moist continuously and prevent it from drying off. What you need to keep in mind is that you don’t want he area directly underneath the new lawn to dry out. New lawn needs about one to two light applications every day; with heavy watering every second day. Keep an eye on the weather. If it is extra windy it is best to water a little more. Similarly, if heavy rain is falling, be careful not to flood the new lawn. During the heat of summer it is wise to water early and/or late in the day. And remember that during extreme heat new lawn can often require watering up to four times a day. You can tell if your new lawn needs more watering by using the “footprint test”. If your footprint stays, it is time to water! Lawn will only have footprints when there are low levels of water in the leaf blades, this allows the grass to be compressed under weight – hence the footprint test. During the first four weeks or until the lawn is well established, try to limit both human and pet traffic on the new lawn. This will enable the new lawn to have the best possible start at establishing its new root system. Only once the new lawn is finally established and the roots are deep into the soil can you start mowing. This can take anywhere from up to 14 to 21 days but in cooler conditions it might take a little longer. During the warmer months your new lawn will establish its roots much faster.